A Bolivian hero: Froilan Tejerina, defender of our frontier. 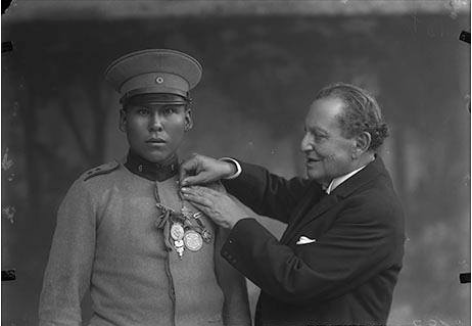 “On February 24 and 25, 1927 the Bolivian sergeant Froilan Tejerina entered the pages of history. This is part of the story. The Paraguayan patrol was taken to the Bolivian camp. Then, the Paraguayan military Adolfo Rojas aggressively took the gun and Froilan Tejerina cap so a fight was generated. Tejerina managed to defeat his opponent, who ended up dead. In the picture, Tejerina receives a medal awarded by the tarijeño people through the City Council President, Juan de Dios Trigo. While some people register the war from 1932 to 1935, the following link provides information that this unfortunate war originated in 1928, as a result of oil finding in the Chaco region, a year after the clash of Bolivian sergeant Froilan Tejerina with that Paraguayan soldier.